Moving into your golden years is no longer something that should be dreaded. Advancements in healthcare means that people are living longer and are mobile longer, as well. The new book, 70 Things to Do When You Turn 70, dispels the myth that life ends at 70. This book, edited by Ronnie Sellers, continues the series of previous titles, including 50 Things to Do When You Turn 50 and 60 Things to Do When You Turn 60. 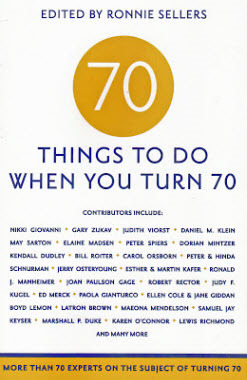 70 Things includes contributions from dignitaries like the Emmy Award Winning filmmaker Elaine Madsen, world-renowned poet Nikki Giovanni, acclaimed writer Daniel Klein, and American Book Award winner Gary Zukav, Retirement Coach Dorian Mintzer, and excerpts of Mark Twain's famous 70th birthday speech. Mintzer's chapter, called, "Turning 70!" outlines how one should appreciate his own life and the perspective and wisdom gained from confronting life's challenges at age 70+. Since people tend to feel more vulnerable as they age, Mintzer writes that people will have less time to fret about life's uncertainties if they focus on the things over which they have control and create purpose and meaning in their lives. Mintzer, M.S.W., Ph.D., B.C.C. (Board Certified Coach) has written about many topics pertaining to graceful aging. She speaks to professional and community groups. As a coach, she helps 50-to-70 something women, men, and couples reinvent themselves in the next stage of life. She's the founder of the Boomers and Beyond Special Interest Group for interdisciplinary professionals, and the 4th Tuesday Revolutionize your Retirement Interview Series for professionals and the public. She is co-author of The Couples Retirement Puzzle: 10 Must-Have Conversations for Transitioning to the Second Half of Life and has also contributed to Live Smart after 50!, 65 Things to do When you Retire, The Six Secrets to a Happy Retirement and 65 Things to do When you Retire: Travel.